Its been a busy time here at the mill & the farm ! lots of knitting & yarn making going on. 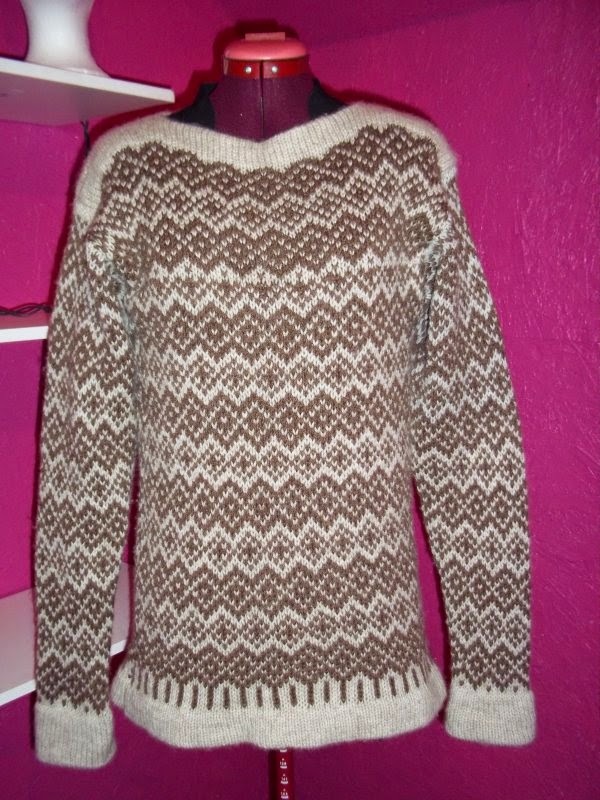 My new line of Retro sweaters are selling well & life is good....it's good to be busy & have every day FULL ! Worked out our breeding programme for the coming fall, selecting Rams to father next years lambs, splitting the ladies up into small breeding groups to be sure we get as many coloured lambs as possible. All my Ram lambs are sold & due to move out to their new homes next week. I will be sad to see them go after taking care of them since the day they were born ! Again this year I kept all my ewe lambs for future breeding. The Fall is almost upon us here. Each morning the house feels colder. YAY....its slipper time again ! 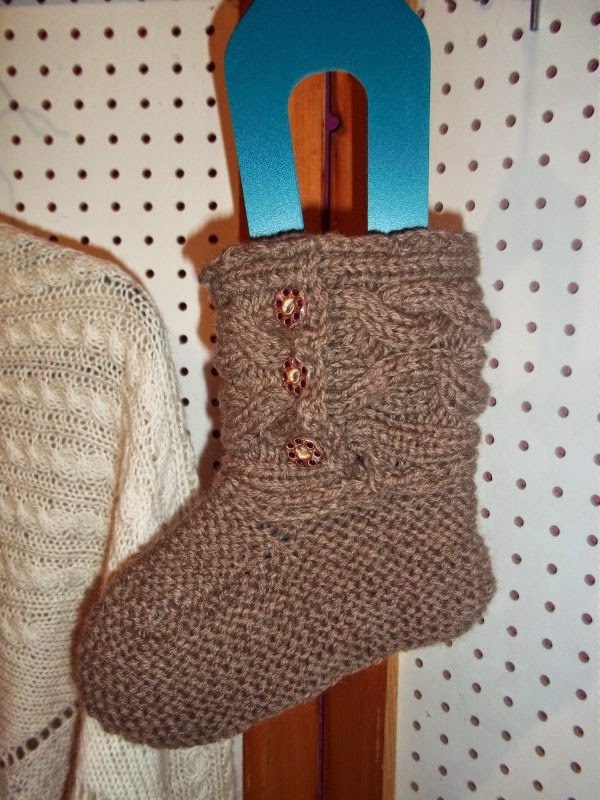 I found a great pattern for knitted booties that I thought I would try using our 100% Organic Shetland wool. 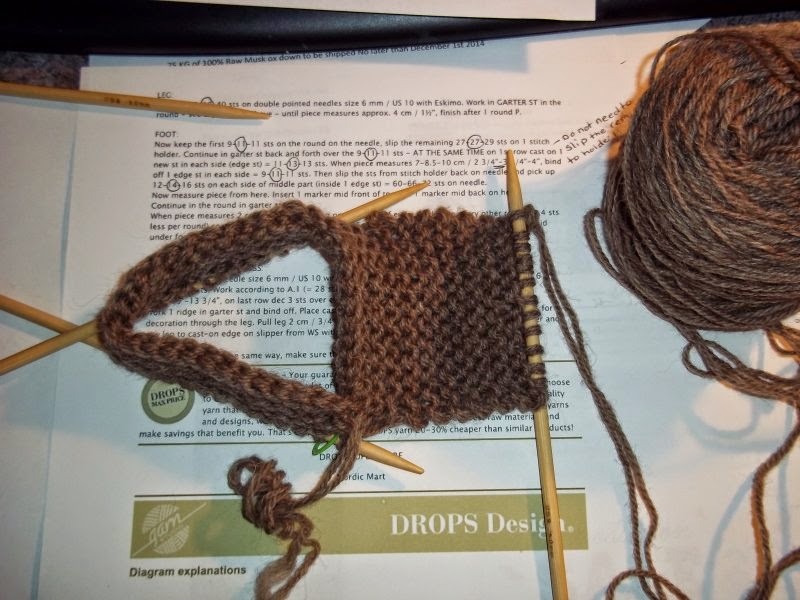 The pattern calls for chunky yarn so i will use 2 strands of our worsted weight held together. Should make for a soft, heavy Durable bootie ! 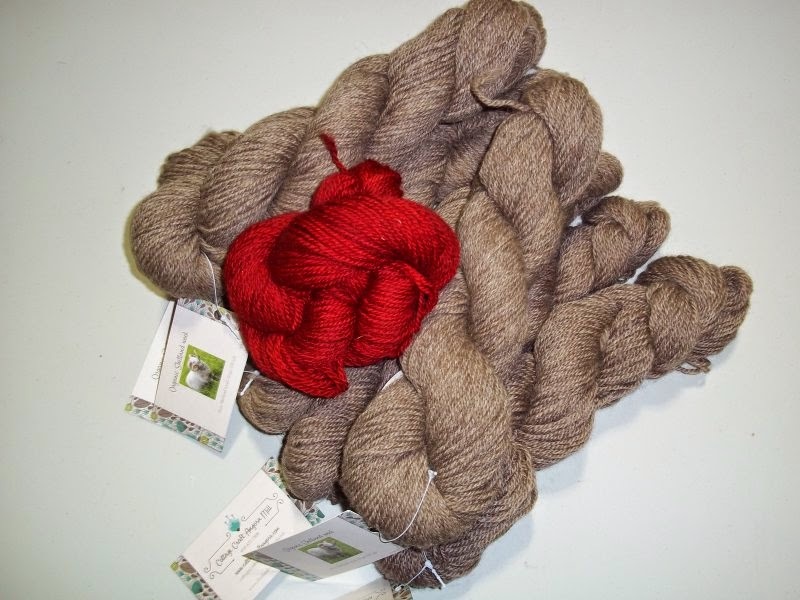 Here is my choice of yarn. All Natural Fawn. The Red is a sample of what you could choose if you don't like fawn & would like to knit your booties same colour as the pattern. Will try to cast on tomorrow & will update along the way ! 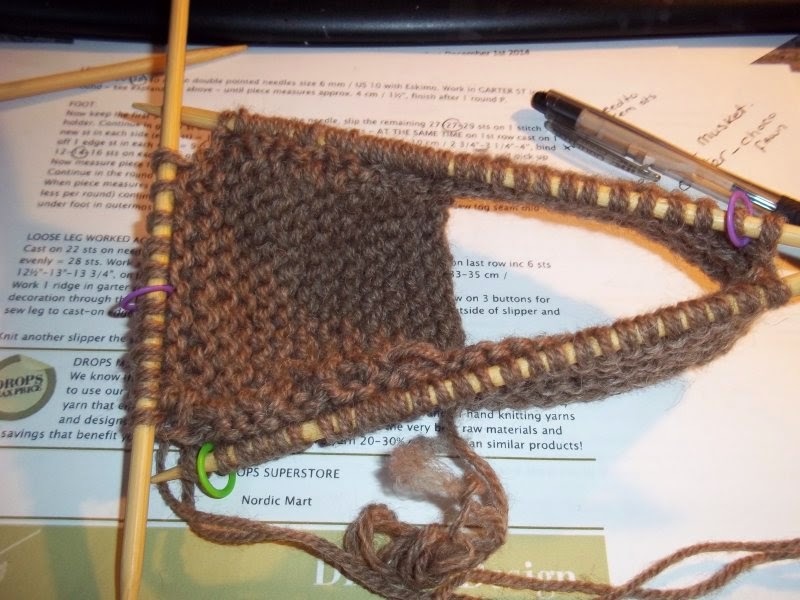 The pattern says to remove the sts your not knitting to a st holder. I left mine on the needle. Some people have said that the pattern was difficult to understand. I find if you read through the pattern several times & Visualise (as you read through) how the work will look on the needles makes knitting go a lot easier. 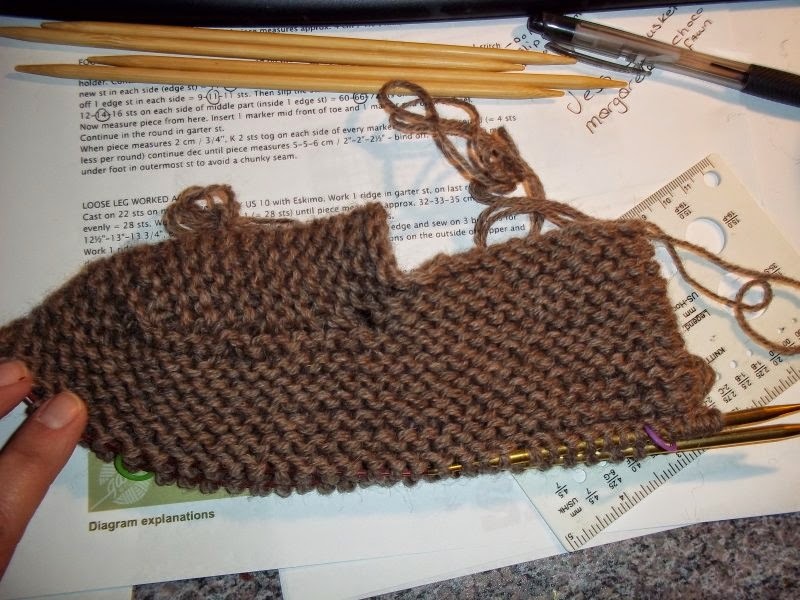 Knitting 'Garter stitch' in the round- purl 1 rnd- knit 1 rnd. The Flap above, I like to slip the 1st stitch of each row to make a very tidy edge to the garter st. This is how it should look after you have knit the flap & picked-up the edge sts of the flap to join your work back in the round. (To enlarge the picture click on it) you will see the st marker placement. The green represents the Beg of rnd. The 2 purple markers divide the both sides of boot ! The D.P.N's are quite full - I will change to 5mm- 60 cm ADDI's until i come to the Decrease shaping. shows the booty starting to take shape. It is easier to try on for size when working on circular needles.Almost ready to start decrease shaping ! One booty complete, neither washed or blocked so I'm expecting it to elongate some. Tell me what colour you would prefer- Natural Fawn or Red ! That is a brilliant red; I think I'd like it! Congrats on selling all your ram lambs. I have a stunning fellow left that needs his own flock because he's related to 3/4 of my girls. I love the fawn, but the red speaks to me...looudly...lol. It's gorgeous! May you continue to have a prosperous fall! I love the red one! :) So beautiful shade. The retro sweater is stunning! So glad it's selling well for you. Yay! for busyness! Both the fawn and the red are beautiful, but I love a touch of color in the winter so red would be my choice. I like the fawn. But the boots would be stunning in the red. I'd knit red ones for my Aunt, posted them on facebook, and she loves them. Jennifer your name was drawn, please contact me with your details so i can mail you your yarns ! Oh my thank you so much, my Aunt (like a second mom) will be thrilled. She still has the original craft I made her as a child. Both colors are so lovely, but I think the red would help punch up winter. The sweater is gorgeous too! I, too, love the red. However, for my feet I think the fawn would be my choice. Hard to choose, but I do love red so much!